Sinn Fein has gone one better than the Greeks in the (probably mythological) 13th century BC Trojan War. They're employing two Trojan horses - Equality and Legacy - in their attempts to infiltrate and capture the twin Irish citadels of Dublin and Belfast by taking their radical history makeover to another stage. Not only are the ignorant and gullible to be convinced that the IRA went to war over equality rather than a united Ireland (which they clearly failed to get), but they're to believe that republican violence was largely defensive and the real baddies were the security forces. 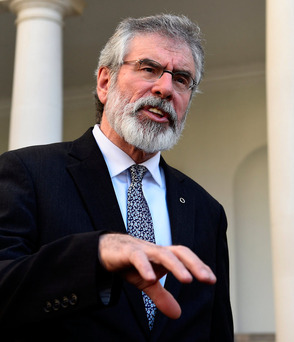 To refresh your memories, toward the end of 2014, Gerry Adams explained to a meeting of the faithful (and an undercover journalist) that the point of the party's approach to unionists was "to actually break the bastards - that's the point. And what's going to break them is equality...That's what we need to keep the focus on; that's the Trojan horse of the entire republican strategy". The trouble with their equality narrative is that no one who is both sane and informed thinks that the petty discrimination in Northern Ireland ever justified murder. It was not - as the Sinn Fein grievance-mongers claim - an "apartheid state": all citizens were equal under the law and shared educational and welfare benefits so generous that few nationalists moved south. Yet because the Republic of Ireland claimed to own the territory, the minority showed little loyalty, and republican violence domestically and armed incursions from across the Border never went away, an unimaginative, often bigoted, unionist establishment used gerrymandering and discrimination in what they saw as self-defence. What's more, these days it's hard to see what there is reasonably to complain about on the equality front, which is why reporting from the Stormont talks last week, Michelle O'Neill - appointed in January by Adams as Northern Ireland party leader (imagine that happening in a democratic party?) - said legacy issues were proving the main sticking point. Movement was also required "on equality issues", she added, but it was clear that these had been relegated to the ha'penny place. For years, the Sinn Fein mantra was that there must be no hierarchy of victims: the bomber deserved as much respect as the bombed. Nowadays, they aspire to see soldiers and policemen in the dock while republicans literally get away with murder. The State is required to produce evidence against its own servants, but the IRA kept no documents and operated the code of omerta, so the criminal justice system is anything but a level playing field. The present system is completely lopsided. Just take the statistics in that great book Lost Lives: republicans killed 58.6pc of the 3,665 who died in the Troubles, loyalists killed 29.2pc and security forces killed 10pc. The Royal Ulster Constabulary, 273 of whom died, killed only 50. You might expect Sinn Fein to be embarrassed that the Provos were responsible for 48.5pc of deaths, but they have taken lying and manipulation and self-deception to exceptional levels. They have brilliantly muddied the waters by alleging that many IRA killings would never have happened had the security forces been efficient in dealing with warnings; they display utter contempt for loyalist paramilitaries by claiming that virtually all their murders were organised by the security forces; and through relentless demonising of the good people in uniform who kept most of the population safe, they have adjusted nationalist and liberal moral compasses. As Dr William Matchett, who spent years in the RUC and in Special Branch and has written the fine, well-researched Secret Victory: The Intelligence War that Beat the IRA, put it, too few people remember that the "armed struggle was illegal, immoral, sectarian, unlawful, unethical, and wrong". But with the help of "a multi-million pound industry… in which law firms, NGOs, academics and the liberal elite have prospered," he points out, the British state has ended up concentrating most of its efforts on investigating itself and the people who fought for it, rather than those who sought to destroy it. The British public is fed up with enormous sums of money being spent on the pursuit of soldiers by zealous lawyers. Phil Shiner, who was recently struck off, cost the UK ministry of defence close to €100m defending soldiers against dishonest claimants he had sought out in Iraq. People are looking at the charging of three soldiers who served in Northern Ireland in the 1970s and wondering how the hell Martin McGuinness escaped justice. They sympathise with the Justice for the Northern Ireland Veterans organisation who say: "The soldiers of that generation believed they were the good guys risking their lives to protect the people of Ulster." The Sinn Fein demand for an international, independent truth commission has been a sick joke. McGuinness not only lied to the Saville Inquiry into Bloody Sunday, he had his heavy mob intimidate anyone he thought might give unhelpful evidence. There are sound arguments for an amnesty, but I understand Dr Matchett's objection that this is what Sinn Fein really wants since it would help to retrospectively legitimise the IRA's terrorism. What is clear is that such a difficult problem should not be left to local politicians who distrust each other. I agree with the commentator Alex Kane that it's time to drop the intractable issues into the laps of independent people. If there is any hope of reinstating the Executive, equality and legacy should be put out to grass for now.